OREGON STATE SPORT STACKING CHAMPIONSHIPS took place on November 21, 2009, at Village Baptist Church in Beaverton, OR. Thanks for checking us out. Oregon Stacks serves as your first place to go to find all things stacking in the state of Oregon. If you're interested in sport stacking in your local school, after-school program, church or organization, send me an email at frankt@vbconline.org. Feel free to visit and check out the stacking program at Village Baptist Church in Beaverton, OR. For more information on stacking, also check out Speed Stacks and the WSSA websites. Overall results at this year's Oregon State Sport Stacking Championships seem to be an echo of last year. "Speedstackinggirl" Rachael Nedrow took home top Oregon stacker honors at the 2009 Oregon State Sport Stacking Championships held at Village Baptist in Beaverton, OR on Nov. 21, but only placed third for the individual all-around stacker list. California stackers Beau McDowell and Lillian Chin took the top two spots, and Matt Sunga took fourth. Grady Moran from Washington State placed fifth overall. 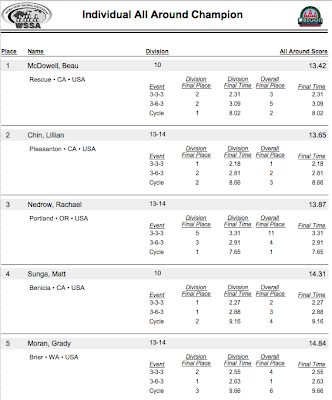 Individual all-around scores are calculated by adding the combined scores from the individual 3-3-3, 3-6-3 and cycle events. Rachael's was hampered by a less-than-stellar showing in the 3-3-3 event. Her best time in the finals was 3.31 seconds, over a second way off what she could do. In 2008, Rachael had the best overall score among Oregon stackers, but was outpaced by stackers from Washington and Utah for the individual all-around stacker honors. Oregon Stacking Championships featured participation by stackers from the West Coast, California, Oregon, Washington and British Columbia. Kalama Elementary from Washington sent a team of six stackers. Several state records for different age divisions were set for California, Washington, British Columbia, and Oregon. On the home front, Rock Creek Elementary led by P.E. instructor Lori Meeks made its debut in the 10U Team Division. The fourth grade stackers (Mark Huynh, Marissa Pogolrec, Ben Fung, and James Domico) are newcomers to the sport, having only picked up the sport two months ago. Speed RACR (Rachael Nedrow, Anne Tan, Charlotte Lindley, and Rachel Mumaw) improved their state team relay record in the Timed 3-6-3 Relay. More results from the Oregon Tournament will be forthcoming, and all records are unofficial pending verification by WSSA. If you're in the Beaverton area, make sure you pick up a copy of the Beaverton Valley Times that came out yesterday. The speed stackers at Rock Creek Elementary are featured on page 7. I'm waiting to see if the article gets published online. So far, nothing yet. UPDATE Nov. 21, 2009, 3:42 AM PST. I just checked and the article is online. Click here to read all about it. Bring a food bank donation to get a discount to the admission for the Oregon State Sport Stacking Championships. Spectator admission is $2 for adult and $1 for children, but bring a donation for the Village Food Bank to get a dollar off discount. The food bank would like donations of the items listed below, ones most needed are in BOLD. Actually, the last time I checked the official count for the WSSA STACK UP! was at 139, 824 (as of 12:40pm PST, 11/13/09). And this doesn't include the 103 stackers yesterday at Rock Creek Elementary 4th grade P.E., Village Baptist after school, and Southwest Hills Baptist AWANA. I've been trying to fax our numbers in all morning but have not been able to get through. I talked to Lynn at Speed Stacks and she confirmed that the fax machine has been busy since yesterday, with the faxes coming in from not just the United States, but all over the world. It may be middle of next week before all the numbers are verified and we get a final count. Yesterday was a full day of stacking in Beaverton. Started out with "Stack Masters" at Rock Creek Elementary as fourth graders got a taste of what it would be like to stack in competition. Everyone went up to the stacking table and stacked in front of a judge. Fumbles that went uncorrected would result in a scratch. But the kids all did a great job. Overall fastest stacker was nine-year-old Mark Huynh with combined time of 27.51 seconds (3-3-3 stack, 4.46 seconds; 3-6-3 stack, 5.72 seconds; and cycle stack 17.33 seconds). "Stack Masters" Part 2 will take place on Monday, Nov. 18, when the other two fourth grade classes take their turns. Then we had after school STACK UP! at Village Baptist. We had a modest turnout but one of the highlights was when Oregon's fastest stacker Rachael Nedrow joined us. She got to stack Jumbo Stacks, and also had to figure out a puzzle of how to stack a single tower of Jumbo Stacks all the way to the ceiling without the use of any helps (ladders, chairs, etc.). Credit for that brain buster goes to the Kidologist and fellow stacker Karl Bastian. Afterwards, my daughter Anne took charge and brought the stacks to the AWANA at Southwest Hills Baptist, where she led them in "Builders and Blasters" and other stacking games. Wow! Anne is coming into her own as a leader. She could be the next sport stack ambassador. Join us to set a new world record in stacking. The annual STACK UP! happens this Thursday all around the world and we want to invite you to come help set a new record this year. If you're in the Portland, Beaverton area, join us at Village Baptist Church on Nov. 12 from 3:30-6:00 pm at the Willamette-A Meeting Room on the lower level of the new worship center. Village's address is 330 SW Murray Blvd., Beaverton, OR 97005. You don't have to bring any equipment. We'll have regular stacks, Battlestacks, mini-stacks, Super Stacks, Jumbo Stacks, and Pro Series cups for you to try out. Thursday is the day, and we're glad you're on board to crack a new Guinness World Record for "Most People Sport Stacking at Multiple Locations in One Day." You will be joining participants from all over the world in this united stacking effort. As of this writing, we have more than 1,500 schools/organizations registered with nearly 270,000 projected stackers from 26 countries. We need everyone to participate to beat last year's record of 222,560 and exceed our goal of a quarter million stackers. Have a terrific STACK UP! and stay tuned to the WSSA home page for updated tallies on the STACK UP! counter. 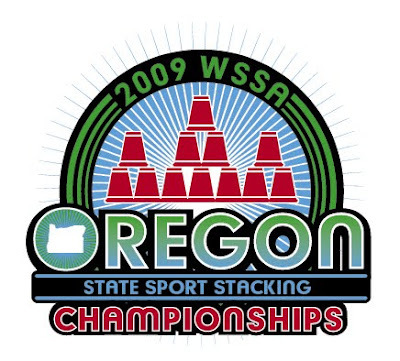 Registrations for 2009 Oregon State Sport Stacking Championships have been coming in this past weekend. And so far, we have registrants from Oregon, Washington, California and CANADA. It's not too late yet to register. The early registration has been extended till Friday, Nov. 13. You can register by downloading the forms from the WSSA website, from Village's website, or registering online at active.com. Some of you who have picked up the 2009 Oregon State Sport Stacking Championships registration forms have mentioned that the logo on the form is the old one from last year. I apologize for using the old logo, but I did not have the logo for this year's competition at the time. But here it is, the new logo for this year's competition. What do you think? I will be updating the registration forms with the new logo and will post new versions of the registration forms later this week.